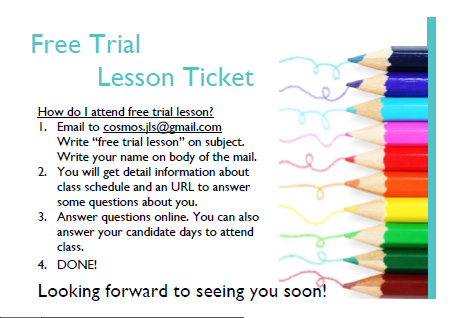 If you are looking for a Japanese language school, sign up for a free trial! We do not ask for any material fee or registration fee. If you have your own material that you would like to continue studying, you can bring that along. If you do not have a specific textbook/curriculum in mind, you can tell us what you would like to improve (writing, speaking, reading etc.) and what you are interested in and we will plan a curriculum that fits your needs. You can come for class several times a week or once every two, three weeks. It really is a great environment for anyone who wants to learn Japanese!